CBIG Consulting has appointed Jeffrey W. Stacey to serve as Principal and General Manager of its Western U.S. operations. This is an ideal setting for Jeff. He can use his board relationships and entrepreneurial strengths for the west’s unique environment that admires the spirit of opportunity and adventure. 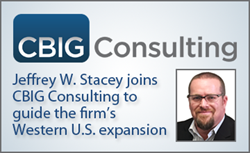 International Big Data analytics firm CBIG Consulting has appointed Jeffrey W. Stacey to serve as Principal and General Manager of its Western U.S. Region. Mr. Stacey has been a serial entrepreneur and Fortune 500 executive, recently having built Analytics Business Lines at Cognizant, IBM, and several small but key Big Data technology companies. Mr. Stacey’s role includes overall operations and project oversight, staff recruitment, business development and executive sales support in this region, which includes Alaska, Arizona, California, Colorado, Hawaii, Idaho, Montana, Nevada, Oregon, Utah, Washington, and Wyoming. Mr. Stacey will also create business growth initiatives with targeted solutions that resonate with the C-Suite in growth markets, including but not limited to services aimed at leveraging investment dollars spent on CXO Business Analytics, and next-generation opportunities in Data Monetization, and IOT. CBIG Consulting is an international team of experts in Business Intelligence, Big Data Analytics, Data Warehousing, and Cloud-based Analytics platforms. Named a top BI and Big Data consulting firm by independent research organizations and publications, CBIG’s management consultants, business analysts, data architects and engineers are seasoned professionals dedicated to the analytics space. CBIG works with global enterprises, mid-size businesses, and non-profit organizations in solving mission-critical reporting and analytical needs. CBIG is headquartered in the Chicago area and has additional offices in San Francisco, Boston, Denver, Austin, Raleigh, and Seattle in the U.S.; Sydney, Melbourne, Auckland and Singapore serving the Asia-Pacific region; and London serving the EMEA region. For more information, please visit http://www.cbigconsulting.com.